John Casterline, Robert T. Lazarus Professor in Population Studies and professor of sociology, is director of Ohio State’s Institute for Population Research (IPR), one of the premier population and health research centers in the world and one of only a handful with concentrated expertise in the demography of Africa. Casterline and a team of affiliated faculty — Professor Samuel Clark and Associate Professor Sarah Hayford from the Department of Sociology — are at the forefront of research investigating a broad range of population and health issues that affect the well-being of families and communities in Africa. According to United Nations projections, Africa’s population will triple between 2000 and 2050, increasing from about 800 million to roughly 2.4 billion people. It will then nearly double between 2050 and 2100, to 4.2 billion. At the end of the century, Africa is projected to have nearly as many people as all of Asia, and roughly as many as the entire world did in 1980. Nearly two out of every five people on Earth in 2100 will be African. The birthrate average for African women is significantly higher than the global average: 4.7 children per woman in Africa compared to 2.5 children per woman globally. Scholars and policymakers expected Africa’s fertility to follow the path of Asian and Latin American countries in the 1960s and 1970s, when birth rates declined rapidly as women gained better access to education and modern contraception. However, birth rates in Africa have remained high. According to Casterline, the bonds and exchanges in traditional kinship systems may explain, in part, the persistence of the desire for a large number of children in many parts of Africa. With a three-year $1.6 million grant from the Gates Foundation, awarded in August 2018, Casterline and Clark will investigate these and other obstacles to widespread adoption of modern methods of contraception in Africa. A crucial catalyst for a decrease in family size, Casterline argues, would be recognition by policymakers in Africa that the current demographic trajectory is a major obstacle to improvement in the well-being of their populations. Africa has the potential for a large demographic dividend. “However, cashing in the dividend requires investment in education and a business-friendly policy environment,” Clark added. The demographic challenge is not simply a problem of numbers. In many low- and middle-income countries, most deaths happen at home and are not officially recorded or given an autopsy and cause of death. The resulting lack of information about priority diseases makes health system decision-making challenging. In much of Africa, researchers rely on verbal autopsy as the method to ascertain the probable cause of death. Although imperfect, it is the best alternative in the absence of autopsy and medical certification. Clark, who has conducted research on the population impact of HIV, is a member of the World Health Organization’s Verbal Autopsy Working Group — researchers, data users and other stakeholders who are developing standards for verbal autopsy. With colleagues at Ohio State, other universities and in Africa, Clark is developing statistical methods for automated cause-of-death assignment using verbal autopsy data. Migration is currently at the center of fierce debates between mainly poor sending countries, many in Africa, and richer receiving nations. But what happens to the children of those families when an adult must migrate to another country for work? Hayford, who has been studying family structure across a wide variety of countries for more than 10 years, is addressing this issue as part of a five-year, $5 million study funded by the National Institutes of Health (NIH). Drawing on theoretical frameworks of migration, child development and the early life course, Hayford and 15 project personnel from across four countries are examining how migration of family members alters children’s development, aspirations, education and subsequent life-course transitions to address questions like: Does the presence of a migrant in the household change the way young children and teenagers think about their future? Do they envision a future at all? New information gathered on the role of familial migration and child development can help inform programs and policies directed at children in areas with a high prevalence of labor migration. Globally, there are just a few university research centers conducting research on African demography. Ohio State’s Institute for Population Research (IPR) was established in 2000 with the goal of building an internationally recognized, multidisciplinary population and health research center with signature strengths in family demography, reproductive health, mortality and immigration. Core funding comes from the NIH, including renewal in 2014 of a five-year NIH Eunice Kennedy Shriver National Institute of Child Health and Human Development Grant. 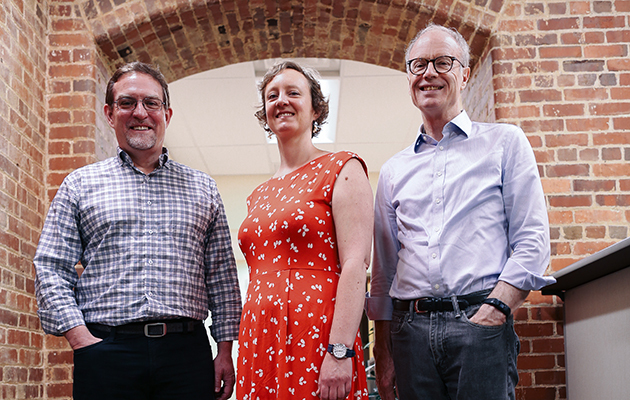 “NIH support for such centers recognizes a central fact about contemporary research on population and health problems: Progress and breakthroughs are made by research teams that span multiple disciplines,” Casterline said. IPR brings together researchers from seven colleges and 17 departments at Ohio State to examine challenges facing families, children, adults and communities. In various ways, IPR serves as a bridge between the social sciences and biomedical research communities at Ohio State. The institute provides affiliates administrative and technical assistance with research projects, maintains a large seed grant program to launch new projects, and hosts a series of lectures and research seminars by local and visiting scholars.